The 2006 Mustang GT came with a 300hp 4.6L V8 engine, anti-lock brakes, dual exhausts, fog lamps in the grille, rear decklid spoiler, 17-inch wheels, and a 6-way power adjustable driver's seat. The GT can be upgraded to the Deluxe option which includes the Shaker 500 Audio system and a seat upgrade. Shelby GT-H The Shelby GT Hertz is back in 2006. Like the original GT-350H from 1966, this GT-H features black and gold paint and they were only available new to the Hertz car rental agency. Other styling upgrades included side scoops, custom wheels, billet style grille, custom lower grille splitters, custom hood with vents. Only 500 of these cars where produced in 2006. 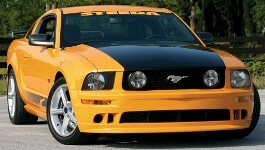 Shelby Motors in Las Vegas took the stock 4.6L 3V V8 from the GT coupe and added an extra 25hp and 10lb-ft of torque. 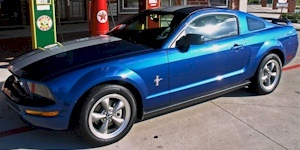 The 2006 Southern California Special was limited to 600 V6 Mustangs and included 9" silver racing stripes, chrome exhaust tips, Pony package (with 17 inch painted aluminum wheels, GT rear wing spoiler, fog lamps, ABS/Traction control, GT shocks, swaybar, and steering gear), special California edition "gas cap" badge, interior upgrade package (My Color Dash illumination, Chrome trim accents), power driver's seat, and Shaker 500 audio system. In 2005 a similar special model was called the San Diego Special, and starting in 2007 changed to a GT modification called the California Special. Stampede Edition The 2006 Stampede Edition of the V6 Premium Coupe with the Pony Package (17-inch painted aluminum wheels, grille-mounted fog lamps, and spoiler), chrome exhaust tip, dual over the top silver racing stripes, Pony spinner wheel caps, a Stampede gas cap, and an engraved serial numbered plaque on the dash. They could be ordered with an automatic or manual transmission. You could choose between Redfire, Vista Blue, Black or Tungsten Gray. Only 500 units were built. This was a factory Ford regional special only for the dealerships in Oklahoma and Texas. 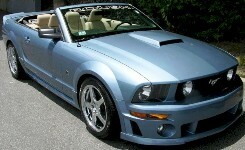 The 2006 Saleen comes in two body styles and three flavors. You can get the coupe and convertible in an S-281, S-281SC Supercharged, and the S-281E Extreme. New for 2006 is the optional Scenic Roof option which gives you an entire roof of glass. Mustang Roush Roush Performance Products offered both performance parts and turn-key Mustang conversions. Three upgrade packages are the Stage 1, Stage 2, and Stage 3. The Stage 3 offers 415hp and 385 lb-ft of torque in its intercooled ROUSHcharged and tuned 4.6L, 3-valve V8 engine. Also offered is the seven piece body kit, suspension upgrades, 18 inch wheels, custom leather interior, and Roush gauges just to name a few. 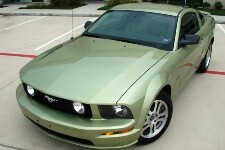 Steeda Autosports offered both performance parts and turn-key cars for the 2006 Mustang model year. Modifications included: custom hood, air dam, and spoiler; Steeda wheels; suspension improvements; and engine performance upgrades. Models included the V6, GT, Q 350, and Q 525. The Q 525 has 500hp at 5400rpm with its Steeda/Magna Charger supercharger system with intercooler.